KALAMAZOO, Mich., Nov. 14, 2018 – On Saturday, November 17, the Kalamazoo Symphony Orchestra continues its exploration of fifth symphonies with the “Symphony No. 5 in E-flat Major, Op. 82,” by Jean Sibelius. Sibelius crafted his entire fifth symphony from one simple, four-note idea inspired by the flight of swans. 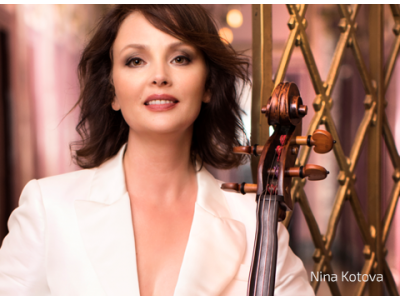 To conclude the concert, Russian-American cellist Nina Kotova joins the orchestra for Antonín Dvořák’s “Cello Concerto in B minor, Op. 104.” In this work, Dvořák innovated a new way for the cello to interact with the orchestra, creating a concerto that is simultaneously grand and intimate. KSO Resident Conductor, Daniel Brier, will lead the orchestra through this dramatic program. Tickets are available through the Miller Auditorium Ticket Office, or at KalamazooSymphony.com. The Wiser Financial Concert Prelude, a popular pre-concert talk held from 7-7:30 p.m. in the auditorium, is free for ticket holders and provides insights into the program's music and artists. The evening’s Student Showcase features Grace Field’s Cello Studio from the Suzuki Academy of Kalamazoo, at 7:30 in the Grand Tier lobby, with the concert beginning at 8 p.m. Immediately following the concert, guests may also attend the KSO’s new, immersive AfterWORDS discussion with Brier and Kotova in the auditorium. Tickets start at $24 and may be purchased online through the KSO's box office, or by calling the Miller Auditorium box office at 269.387.2300. In recognition of Veterans Day, veterans and active service members may receive two free tickets to the Sibelius & Dvořák concert. Student $5 Rush Tickets, with a valid student ID, are available at the Miller Auditorium Ticket Office the night of the concert.